Our school season has started back up, and between that and our recent volunteer trainings, a couple ID questions have come to the fore. Perhaps the most important one has been "is that vine poison ivy or Virginia creeper?" Now, once upon a time, I wouldn't have batted an eye looking at a vine. I stuck by my tried and true rhyme: "Leaflets three, let it be; hairy rope, don't be a dope." How could anyone mistake poison ivy ever again? But a few years ago a fellow naturalist pointed out that Virginia creeper can also have a hairy vine. What?!? Say it's not so! But, alas, it is. What is a naturalist to do? Knowing that all things can be identified if one just knows the key thing to look for (although, admittedly, it won't always be something one can see in the field), I have set out on a mission to learn how to tell these two plants apart...in the winter...when there are no leaves. I share with you here and now the fruits of my labor, namely, a close examination of the rootlets that give the vines their hairy appearance. So, here we have two photos of hairy vines. According to my research, two of the key things to look for are the color and thickness of the "hairy" parts. 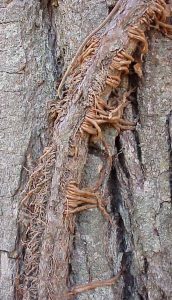 Poison ivy vines are covered with very thin, "dark" rootlets, which help it grasp the bark of the tree to which it clings. 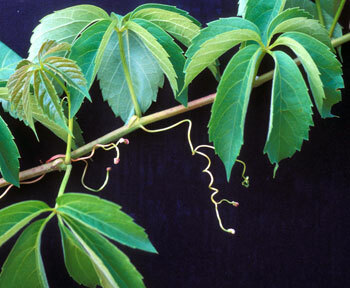 Virginia creeper has thicker, "lighter" tendrils (not rootlets, apparently), which also cling to the tree. Now, I know what you are thinking. This is easy when they are side-by-side, like telling a downy from a hairy woodpecker is easy when the birds are side-by-side. Until one has developed a trained eye that automatically knows what it is seeing, these differences aren't always so obvious. What if the tendrils are young and thin? What if it is a really old poison ivy vine - do the rootlets thicken with age? And, as we all know, color is not always the best diagnostic tool ("poison ivy has red leaves" - um, yes, except when they are not red at all). 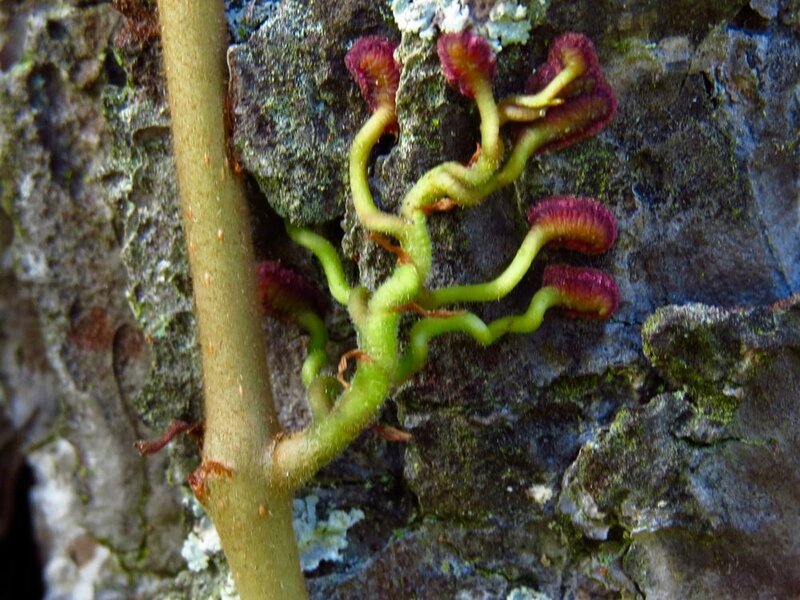 Close-up of Virginia creeper tendril with pads (photo credit: Dale Hoyt, Nature Rambling blog). Ah-ha! That must be it! Those pads certainly seem obvious in these photos, but are they as apparent when one is facing a vine, in the woods, in winter? Fortunately, this afternoon I had an opportunity to check. I'm sorry to say, the pad prognosis was not promising. Vine #1: Thick and light-colored - must be Virginia creeper. No pads evident, however. Vine #2: Those hairs are pretty fine, and certainly darker than those on #1. I'm going with PI on this one. Vine #3: My hand is in there to show just how robust this vine is - nearly 3" diameter. It is densely hairy, but those hairs, well, some are rather thick and light-colored, while others are thin and dark. ACK! I was afraid this would happen. Looking up the vine, I could see there are actual branches coming out of it, which, I have been told, is an indication that it is PI: older vines are known to have branches from several inches to multiple feet in length, and VC won't have branches much longer than 4". Therefore, this must be PI. Vine #4: Densely covered with thin, dark rootlets - no doubt in my mind this is PI. Conclusions: Pads on Virginia creeper tendrils are not apparent in winter. I suspect that perhaps they are mostly visible on young/new growth. Additionally, old, robust PI can have thick rootlets, some of which are light-colored. I will be continuing my investigation on the differences between PI and VC vines as the seasons progress, but until further notice, I will stick to the rhyme and avoid touching any hairy vines, regardless of how thick or light the rootlets/tendrils are.